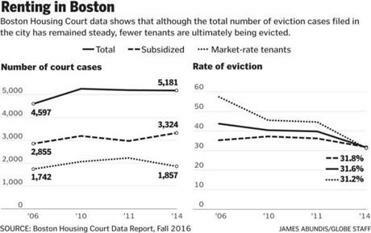 How many evictions are there in Boston? No one really knows. 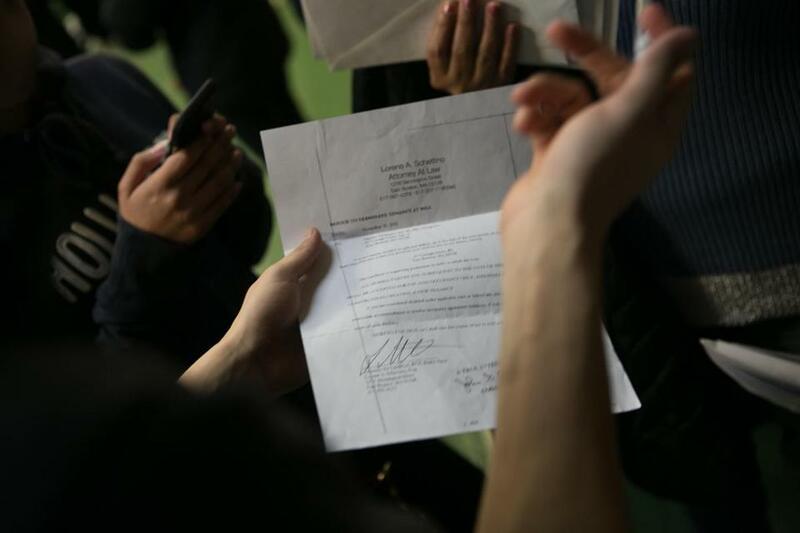 An eviction notice was held at a community meeting in East Boston in February. City officials and housing advocates have long complained there is no comprehensive data on evictions collected in Boston; what few numbers that are available usually come from contested evictions that end up in Housing Court. And even getting those requires an arduous counting of individual cases. The results are usually old and incomplete. Moreover, those figures vastly undercount the extent of displacement in the city, since most evictions don’t even end up in court. So while rising rents and anecdotes of mass evictions from fast-changing neighborhoods such as East Boston have pushed displacement to the fore of the city’s agenda, there’s no clear way to measure just how much of a problem this has become. In a City Hall that is increasingly data-driven, that has become a frustrating challenge. In legislation he filed earlier in December to add protections for renters, Mayor Martin Walsh also proposed requiring landlords to notify the city when they move to evict a tenant. That will give officials a paper trail to document eviction activity in real-time. The data could be used to pinpoint eviction hotspots, allowing city officials to direct counseling resources, and also help them understand what may be causing evictions and how they might be addressed. Walsh has also created a new Office of Housing Stability, which would use the notices filed by landlords to provide tenants facing eviction with information about their rights and counseling resources. Such interventions may head off more evictions before they start, said Lydia Edwards, who heads up the new office. Eviction information is a major missing component from the growing portfolio of data that the Walsh administration collects on city services and public issues. Department heads, staffers, and even Walsh can track everything from burned-out streetlights to library usage across the city nearly in real-time, in some cases via digital dashboards in their office. But to get a handle on evictions, Walsh officials are sending interns to Housing Court to comb through case files and build Excel files one entry at a time, to track where and why they’re happening. As 2016 draws to a close, they are almost done collecting case numbers — for 2015. For now, the best available data is a recent report compiled by three local community groups — Project Hope, HomeStart, and Dudley Street Neighborhood Initiative — that found there were 1,635 court-ordered evictions in 2014. That was down from 2,068 in 2011, even though the number of eviction requests by landlords has remained largely unchanged. 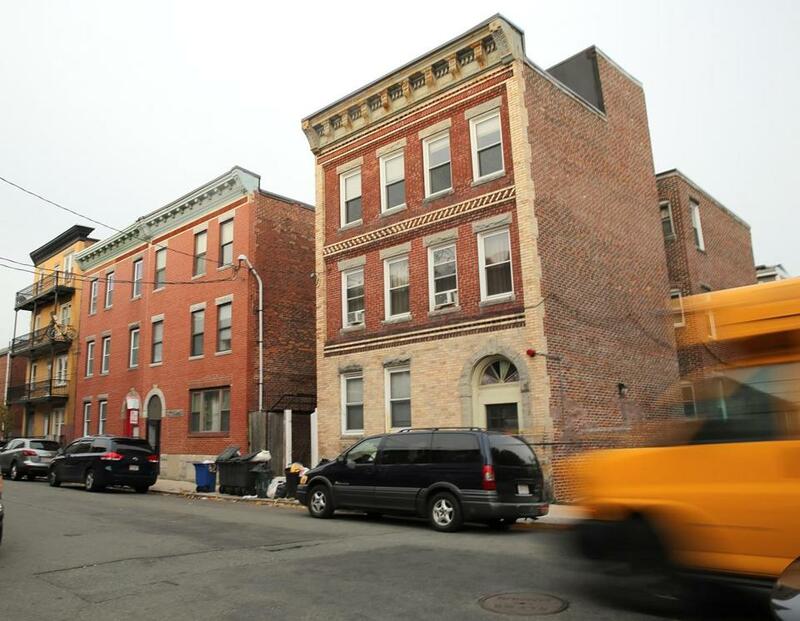 Renters in building at 64 Lubec Street (on right) in East Boston were evicted in 2015. The community groups hired a half-dozen law school graduates who are studying for the bar to work part-time compiling and analyzing eviction cases in Housing Court by hand. Just gathering the data took eight months, said Christine Dixon, who runs the effort for Project Hope. They can only do it once every few years. Their findings, though, suggest that counseling and legal aid available to renters facing eviction is having the desired effect, Dixon said. “You hope that shows that some of the work being put into eviction prevention is paying off,” Dixon said. City officials have been trying to get more systematic records, wrangling with court officials for access to bulk data on eviction filings. But court officials have declined, noting that any bulk data they provide the city must also be made available to the public, including firms that screen tenants for landlords. A spokeswoman for Housing Court noted it was standard policy not to release bulk data, in order to protect victims and litigants from “unwarranted harm.” She noted that recent upgrades to the courts website make it easier to track individual cases online. Some tenant advocates were among those arguing against the court’s giving out bulk data in recent hearings on public access. Mac McCreight, lead attorney for housing at Greater Boston Legal Services, which represents renters who face eviction, cautioned that aggregated court data is not always accurate or up-to-date. Moreover he worries some landlords might use it to “blacklist” tenants who have had a case filed against them, even if the eviction never wound up happening. Dillon and Edwards said the city understands those concerns, and its proposal to collect eviction filings from landlords would specifically exempt information on the tenants from state Public Records Law. The point, Edwards said, is really just to wrap their arms around the situation.